So, it looks as if Khloe is fighting Alex over Leo. 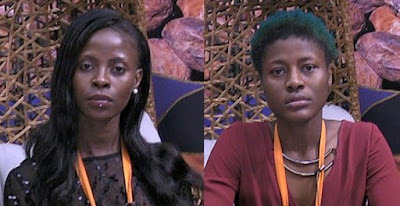 Yesterday during their Nomination, Biggie nullified all their nominations, and placed all of them on for possible eviction. The head of house, Khloe had the veto power to save a pair, and she chose to save Leolex (Leo and Alex). Fast forward to moments later, Khloe and K-Brule started fighting over a drink, and in her usual way, Khloe shouted at KBrule and stated using cuss words. Alex immediately stood up for KBrule, and then told Khloe to stop cussing out at KBrule.. This of curse later resorted to exchange of words, and Alex threatened to “Beat Alex to death”.. Oh, Alex won the argument..and Khloe went to chill out with a stick of cigarette.